"Today we are releasing the first Opera 42 developer build. We have quite a lot new improvements, that focus on quality for newly developed features." The Chromium has been updated to version 55.0.2859.0. After upgrading the VPN stopped connecting. (Pls) bring back DiffieHellman (DHE) for key groups greater than 2048bits (or equal to). I know chromium dev decided otherwise but can you lobby/patch/etc please ? It's a big mistake not to allow standard diffie-hellman ephemeral for key exchange for groups bigger than 2048 and make an excuse by saying 512/1024 bits keys are insecure. 2048, 3072, 4096, 5120, 6144, 7168, 8192, ... keys and so on are not insecure. PS: i wont update from opera 39 until DHE is back. "We have quite a lot new improvements"
Like as per usual breaking VPN this is a major element to this browser, how on earth is it every single time that an update is released that we are left with a major element that is left dissabled, surely this is tested as a major element before updating the beta? @leocg Thank you, that worked. After I could not get VPN working on Opera Stable, it just kept saying VPN is temporarily unavailable. After reading in the forums that it should be working, I tried the previous Dev version and then the Beta. Seeing this release note, I installed Opera Dev (64 bit) 42.0.2372.0 on Windows 10 (64 bit). I installed as Standalone(USB) to avoid any leftover problems after uninstalling the previous versions. When I try to activate VPN I have a continuous Orange indicator and cannot load any sites. I still get the message VPN is temporarily unavailable. Opera is working on the problem. By turning VPN off in the "Connecting" drop down, pages will again load. Do you use any anti-virus or similar software? Also, no extensions installed in Opera. VPN constantly dropping. connects for a second then goes away. "Last Wednesday we have delivered fresh, Chromium 55 based builds. It quickly occurred, it’s one of the most crashing builds we’ve delivered so far this year (ups!). That’s why we’ve quickly prepared an update for you, so that you can continue using the developer version during the weekend. – Windows x64 builds in the final release. In this build, you will also notice some video popup fixes, and more personal news changes. We were not able to prepare the Linux update, and Mac was unaffected by the popular crash, that’s why only Windows builds are being delivered today." VPN still orange - VPN is temporarily unavailable. Opera is resolving the problem. How do you connect to the Internet? Do you use any proxy? Update: I can get VPN to work as instructed above "Settings > Privacy and Security > Privacy > Clear Browsing Data > Delete 'Third Party service data'"
This has to be done each time I fire up the browser so although I can get VPN to work I have to do the above each and every time I have closed the browser so THIS needs addressing as an issue for sure still. VPN is broken. 42.0.2374.0 Windows 8.1 64-bit (WoW64). Please fix. Sits on orange/connecting. "Settings > Privacy and Security > Privacy > Clear Browsing Data > Delete 'Third Party service data'"
"In today’s Opera developer release, we’ve got a number of new features for you. Have you ever wondered, how much this new gizmo you see on foreign shopping site is in your local value? It’s easy now to answer this question with the new Opera feature – currency converter. Our search popup has been upgraded with an automatic currency converter to the currency matched by your location. Just select the value with currency symbol (e.g. $10, 100 Kč), and check the value in the popup. It’s that easy – no need to search for exchange rate calculators online. We’re currently supporting 32 currencies from the European Central Bank. Known issue: the feature may not work straight away on a clean profile (after the first installation), so please restart the browser to see the feature in action. Sometimes, when you run an application for the first time, everything feels so new, that you simply need some time to look around, and get familiar with it. We’d like to make this first time experience as user-friendly as possible for our new users. That’s why we have decided to remove, or delay displaying some information, pop-outs and hints. We’ve also provided a number of usability enhancements, for example the simplified bookmarks structure, or a different logic for showing the sync and tab icons. 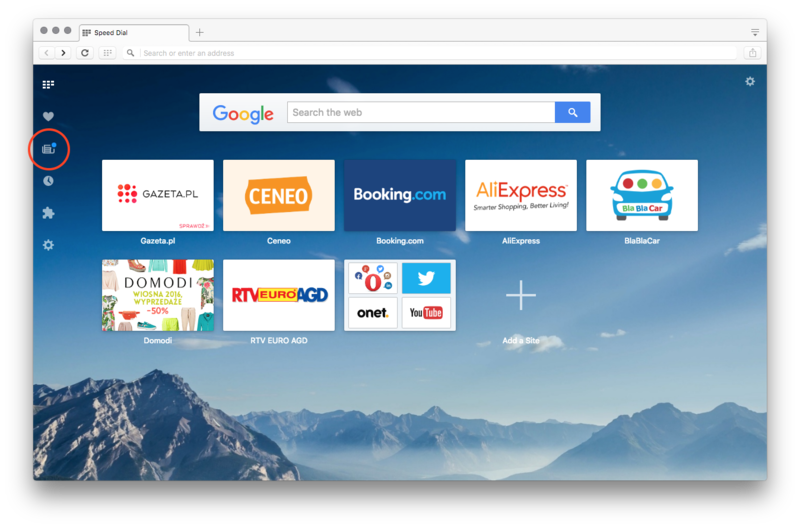 Some time ago, we released the 64-bit offline version of Opera for Windows. Since then, we’ve worked hard to make it fully functional, and now are able to present the Network Installer for 64-bit builds. 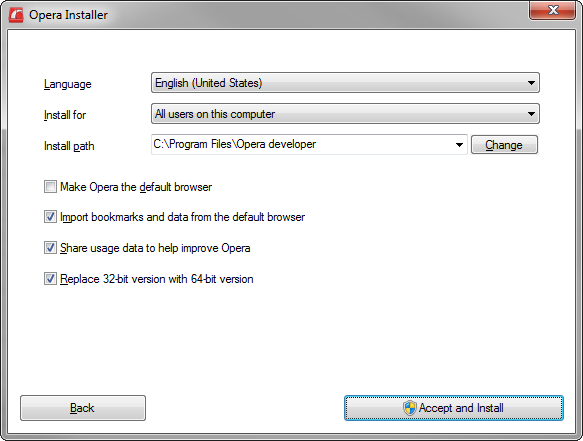 This is the well known network installer you already use to install Opera, but this version is smart enough to install the best option for you. In other words, it detects the architecture it’s run on, and installs either the 32-bit, or 64-bit version of Opera. Moreover, it’s able to upgrade (please don’t confuse with “auto-update”) from the 32-bit to the 64-bit version. After the upgrade, the 32-bit version is removed from the system. Of course it will keep your profile, so your data is protected, and the transition is smooth (you may not even notice it). But please keep in mind, that two Operas on the system share the same profile. If you try to uninstall one of them, don’t remove “user data”, or the second Opera will start with the clean profile. In the latest developer version, you can also get a blue dot notification over the newspaper icon, whenever there’s some new content in “My sources”. 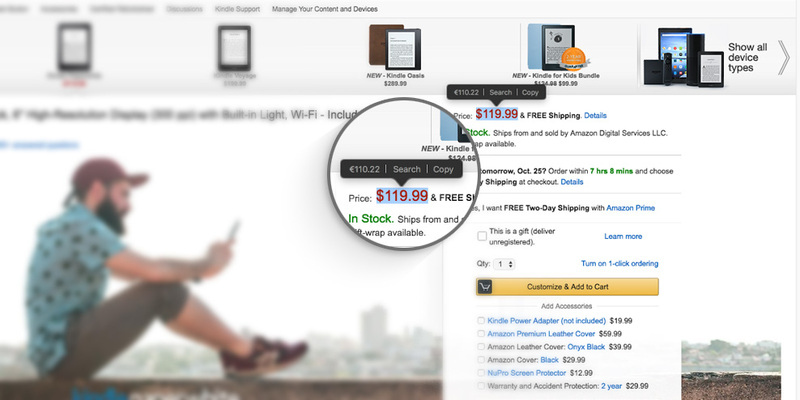 Discovering new articles works with sources from the catalog, as well as the custom web feeds. In settings, you can configure how often the check is going to happen, or disable it completely if you don’t need it. With the push messages support, you can take advantage of so called Push Notifications technique, which allows your website to send notifications to people, even if they are not browsing your website at the moment. To find out more, check out the really nice description on the Google Developers blog. It’s a small, yet useful change: now, you can configure your Speed Dial navigation bar by the context menu. Just right-click the sidebar, and configure which menu items you want visible." The Chromium has been updated to version 55.0.2883.19. – The browser might crash, when turning VPN on and off. We’re already working on this. – On Windows 10, it will be impossible to set the new Opera developer as default, after the 32-bit to 64-bit switch. The workaround for now is to uninstall the 32-bit version, and install the new version.